Get a Jump Start on High School! Help your student get a Jump Start on High School! This summer, we are offering a number of programs to help your student make a smooth transition to high school! Online registration is now open - spots are limited. Letters were mailed to parents/guardians recommending the program(s) that may best fit the student's academic needs based upon the student's placement, teacher recommendations and standardized tests. Registration will close on Monday, May 6th. Please Note: If we do not have enough students to run a class, it will be cancelled, and you will be notified. An enrichment program for students looking to understand the expectations in CHSD 218 high school math and ELA. The program will expose students to expectations in these curricula, while assisting them in making a smooth transition to high school. To register for Early Start, please click here. 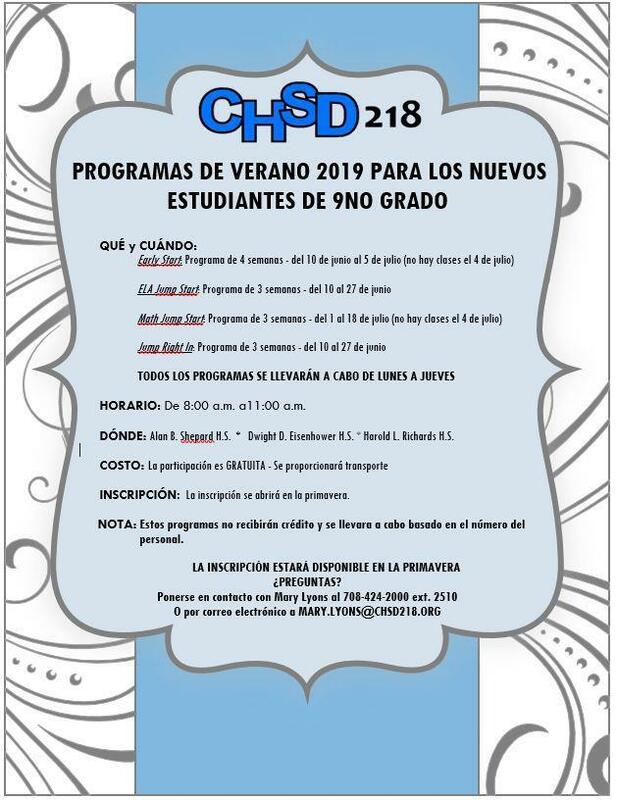 This program gives students in English 1 and Honors English I a chance to show their skills and potentially “jump” into a higher-level English class during the regular academic school year. To register for ELA Jump Start, please click here. This program gives students in Algebra 1 and Honors Algebra I a chance to show their skills and potentially “jump” into a higher-level math class for the regular academic school year. To register for Math Jump Start, please click here. This is a program designed to assist students who may struggle with the “jump” into high school. Students will work on skills needed to make a successful transition to math and ELA classes while learning organization, goal setting, and other skills needed to be successful in high school. Students may be assessed throughout the session to ensure they have appropriate interventions and/or services in place for the regular academic year. To register for Jump Right In, please click here. 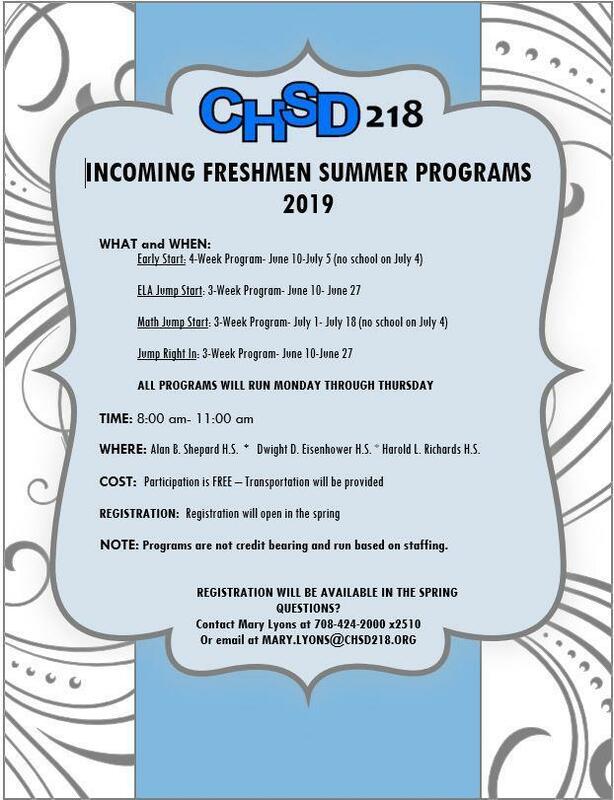 District 218 Summer Enhancement Courses are two-day, non-credit classes that expose students to exciting and fun subjects that are offered at all schools. A few examples that we offered last year were “Fishing 101…Let’s Have Fun!!! !”, “Basic Welding” and “jumpstART: Caffeine for the Creative Mind.” Summer Enhancement Courses are based on fun, active and engaging topics that 100% of the students reported they enjoyed. Try one out!